Can I install Mohawk Hardwood Flooring over radiant heat? Yes, Mohawk Engineered & Longstrip (glueless) Hardwood Floors are suitable for installing over a radiant heated concrete slab. Caution: The slab surface must never exceed 85 degrees F in temperature. Before installing over a radiant heated floor, turn off heat and wait until the floor has reached room temperature. After installing the floor return the heat to the previous setting. Can I install Mohawk Hardwood Flooring over a concrete slab? Mohawk Engineered & Longstrip (glueless) Hardwood Floors can be installed over most concrete slabs (not solid hardwood). The concrete slab must be fully cured for at least 60 days, free of structural defects, clean and visually dry with no history of moisture problems. When testing for moisture, Mohawk suggests utilizing the industry–standard calcium chloride test or the Tramex Moisture Encounter (5 max). Note: All 3/8” solid products may be glued to a concrete slab using Mohawk’s approved glue and sealant system. Light–weight concrete that has a dry density of 100 pounds or less per cubic foot is not suitable for Mohawk hardwood floors. Can I wet mop my Mohawk Hardwood Floor? You should never wet mop a hardwood floor, this will raise the grain and may permanently damage the wood’s surface. 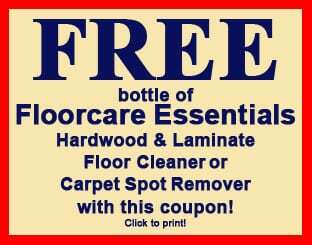 Use Mohawk Floor Care Essentials Hard Surface Products to clean and protect your hardwood floor. Always apply the Mohawk Floor Care Essentials Hard Surface Cleaner directly to the terry cloth flooring mop, not the floor. How can I restore the finish on my Mohawk Hardwood Floor? If your hardwood floor’s finish becomes dull and scratched you can restore the finish by a light screening and recoat of the urethane. Where can I purchase Mohawk Floor Care products? Mohawk Floor Care Essential Products are available through your local Mohawk dealers. See the Store Locator for the store nearest you. Do I have to keep the room temperature and humidity controlled all year round? All hardwood floors can be adversely effected by extreme changes in humidity. During the hot, humid weather a de–humidifier may be required. Although engineered wood floors are less effected than solid wood floors, in the dry, heated winter months humidification may be necessary to prevent surface checking. How can I repair a chip in my floor? If the damaged area is smaller than an inch in diameter you can use ColorFill Putty to repair the defect. If the damaged area is too large replacing the plank may be required. See the Installation Guidelines for additional information and recommendations. Can I install Mohawk Hardwood Flooring below grade (in a basement)? Mohawk Engineered Hardwood Floors may be installed on all grade levels. See the Installation Guidelines for additional information and recommendations. Can I wax my Mohawk Hardwood Floor? No wax, no mess. Mohawk Hardwood Floors are very easy to maintain. Simply use Mohawk Floor Care Essentials Hard Surface Cleaner and a specialty terry cloth flooring mop available from your local Mohawk flooring store. See the Store Locator for a Mohawk flooring dealer nearest you.